I have been imagining what this night would be like ever since I moved to London. When I was just two weeks over eighteen, and really frightened and really lost. I hadn’t ended up where I was supposed to. I had applied to the University of St Andrews and got rejected, and it stung. London was too big, too noisy, too crowded, too rushed, and far too much in-my-face. I wasn’t ready to be propelled out of my comfort zone like that. But maybe I never would have been. A year and two months ago, I couldn’t wait to leave. I had lived two painful years in the big smoke – two years of heartbreak and eating disorder, of loneliness and unrelenting self-doubt – but the one thing that kept me going was this night: the eve of my moving far, far away, to the safety of the Highlands where the rough winds are gentler than the smog of the city and the hills call to something ancient deep within your bones. It was a mighty long detour, but I would finally make it to Scotland, away from all that had hurt me, and I would be happy. Finally. I would go to a small town and live as a recluse, because I’m good at that. Not telling my feelings to others, bottling them up and screwing the cork shut so tight you’ll never open the damn thing again. I am an excellent hermit. But one day a charming young man sat down in my café, and I took his order, and he asked for my number. I almost said no. Because I saw in that pair of blue eyes that he would mess with my plan. Don’t let him, my frail heart pleaded. You can’t handle this and you know it. Do you want to repeat the last two years? I didn’t. Tomorrow was supposed to be the happiest day of my short life so far. I am not good at uprooting myself. It took me two years to settle into life in London, and I don’t think I could have done it without my Irish Cookie Monster. And now I have to do it all over again, without him. And after these twelve months are up, the whole circus starts again. And after that, who knows. I hadn’t planned on moving across the country, five and a half hours (by train) away from my baby nephew, my mother and boyfriend. At least I get to take the cat with me. And I hope a certain Cookie Monster won’t mind the treck up to raid my cookie jar every once in a while. So you won’t see a whole lot of posting around here for the next two weeks or so. I have to pack up all my stuff – which I know is just stuff, but I am a homebird, and only human, so forgive my weakness – and pack up my heart and take myself away from here. There won’t be any Internet for a wee while. This was one of the few things my granny could manage to feed me when I was a kid. I was a really finicky eater. She and my mum tend to make mono-veg soups – just one particular vegetable for the flavour, then onions for a bit of substance, a cube of vegetable stock and water. That’s it. We hardly measure, and it always turns out perfect. It’s easy, quick, nourishing food for the nights when you don’t have the heart to wait for your bowl of warming goodness to be ready. Remember that there is nothing – nothing, not even chocolate – more comforting in the world than a bowl of hot soup and a couple of slices of sourdough bread. It cures anything. Eventually. Boil some water in the kettle – about 2 cups or so. You mightn’t need it all. Place a medium pot over high heat. Place the vegetables and stock cube in it, cover with water and let it simmer for 10-15 minutes, until the vegetables are tender. Blend or puree the whole lot till smooth. Serve with a couple of thick slices of toasted, shamelessly buttered sourdough. 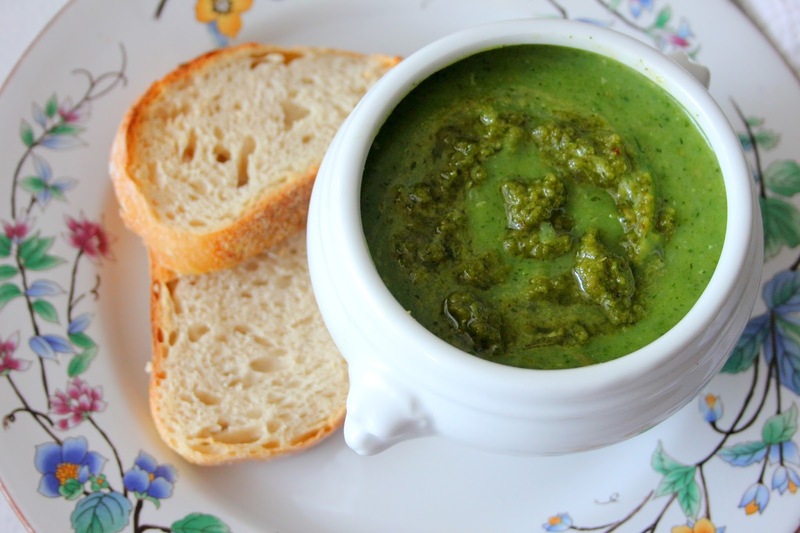 I think many soups are nicely complimented by a dollop of pesto. 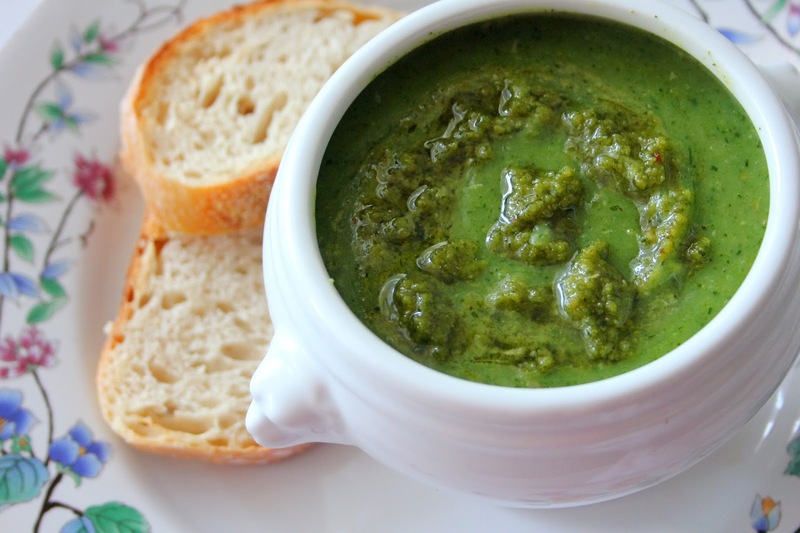 You don’t have to add any pesto to this if you don’t like it, or you could just dip your bread in it. Process all the ingredients in a food processor or blender until they become a grainy paste. Store in a jar in the fridge up to 3 days. Slather it onto toasted bread, mix it into a bowl of pasta, use as a dip or try drizzling it over your soup. Clem! Firstly – best of luck with your move, I cannot wait to read about your adventures from Stirling. The Big Smoke is an intimidating place and I am so happy you came to like it at some point. People move away but distance provides no bounds when it comes to love, whether it be the biological love a family member provides or the love of a partner. Technology these days will help you SO much! I believe in you, you will do amazingly this next year and have a brilliant time. P.S – the pesto looks awesome! When I read the post title, I thought you're leaving ;( but thanks goodness you aren't! I wish you best of luck with your move…and be safe, think of happy thoughts and don't give up on your dreams! 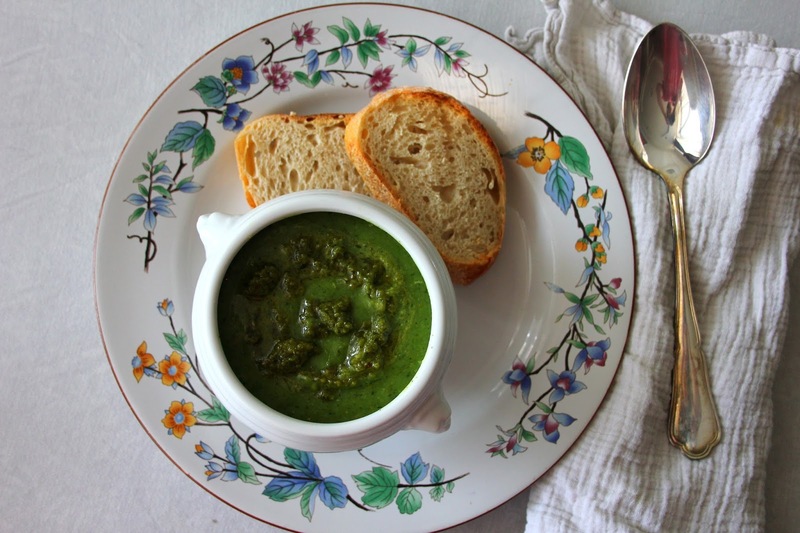 That courgette soup looks so delicious and sourdough is my favorite! Oh Clem this was quite an emotional post but I bet everything will work out.. it always seems to eventually doesn't it!? Best of luck with your move, this could be the start of an incredibly exciting chapter for you! 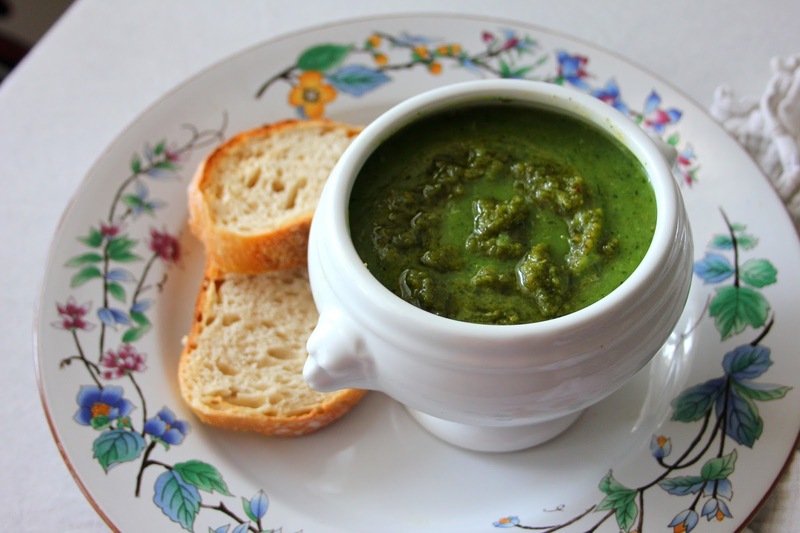 The recipe looks yum as always, love the livening up of soup with pesto! No worries, I'm not going anywhere! Not on the web, anyway.